Last week the U.S. State Department updated its travel warning to Lebanon. A friend called me to check if I am evacuating. Um, no. The travel warning has some new bits and pieces of information, but the State Department has officially discouraged travel to Lebanon the entire time I have been living here. It’s probably been discouraging it since the bombing of the US Marine Barracks in 1982. So while I always read the travel warnings, I’m still here, don’t feel any less safe than I did the week before, and am not going anywhere….. Bars of Beirut – In a city famed for its nightlife, the choice of where to go out can get overwhelming. Mar Mikhael is the current “it” neighborhood, and two of my favorite spots are: Internazionale – a classy but unpretentious cocktail bar on Armenia Street whose crowd spills out onto the street on warm evenings; and Junkyard – a restaurant made of repurposed shipping containers, whose mood and crowd are far more glam than grunge. I love its cocktails and the retro bartenders in vest and tie. Tables spill out onto a large open-air garden, making summer the time to go. 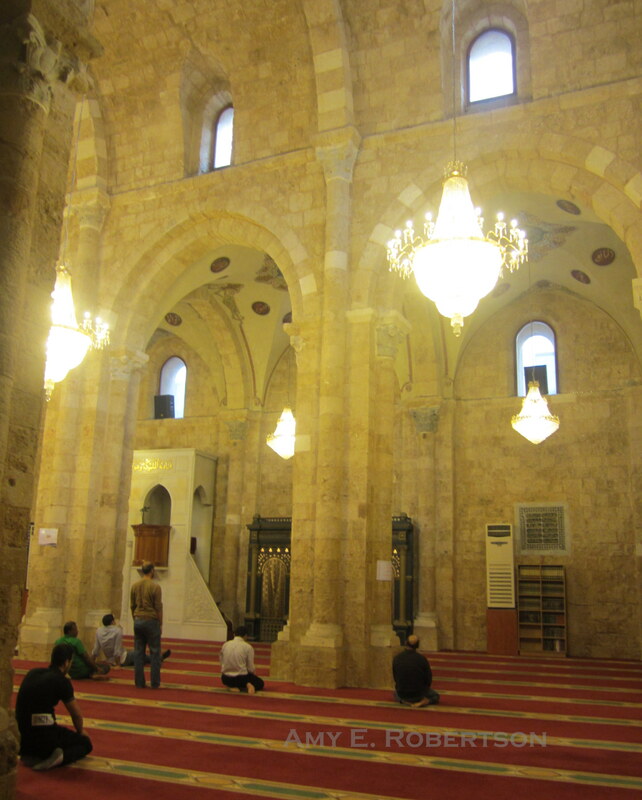 Al-Omari Mosque – in an easy-to reach location downtown, this mosque encapsulates Beirut’s history in a single structure. The building began as a Byzantine church that was built on the ruins of Roman baths. It was converted into a mosque in 635, which lasted until the Crusaders turned it into the Cathedral of St. John in 1115. It was turned back into a mosque by the Mamluks in 1291, and remains a lovely mosque to visit, with its old stone walls and beautifully painted ceiling. It welcomes visitors, and has a rack of hooded black robes available at the entrance for female tourists who may not have arrived appropriately attired. Homecooked meals – Lebanon is famed for its food, and like everywhere else in the Mediterranean, tends to be at its best when prepared by someone’s mom or grandma. 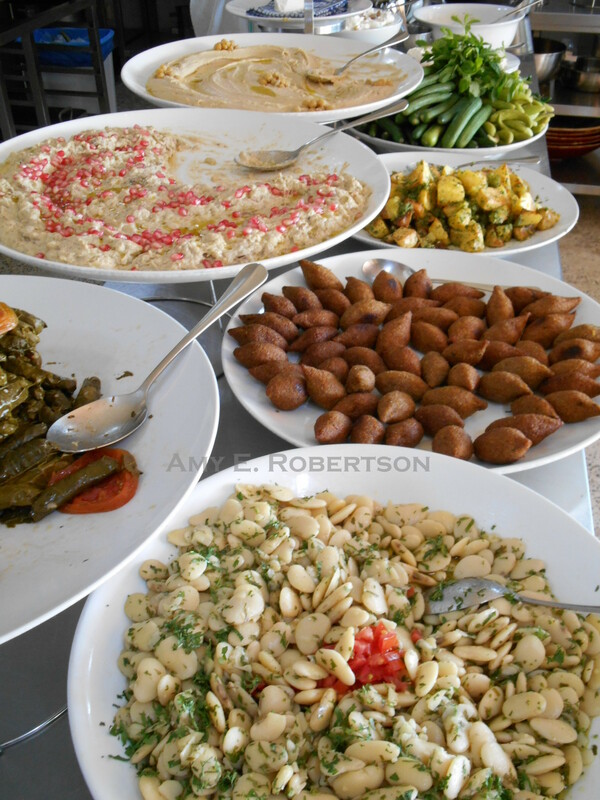 Those of us who don’t have relatives here can head to restaurants like Achghalouna, where underprivileged women prepare a traditional lunch that is served in the garden of a lovely old Lebanese house, or Tawlet, where women from different parts of Lebanon come to share their regional specialties. Souvenir Shopping – while the streets of Hamra are filled with stereotypical kitsch such as t-shirts and jangly belly-dancing scarves, those looking for a more creative memento of Beirut should head back to Gemmayze and Mar Mikhael during the day, and try one of the following: Plan Bey – an “arts and culture concept store,” Plan Bey sells postcards of images from the civil war, modern prints and graphic novels by local authors, and hand-printed notebooks. Their neighboring exhibition space offers an ever-changing supply of souvenirs, such as Kudrish-Syrian kilims and hand-painted ceramics. Artisan du Liban – brimming with hammered pewter plates, ancient fish fossils and hand-painted Arabic coffee cups, this is my go-to shop when I’m preparing to bring presents back home. This week our family celebrated our second anniversary of life in Lebanon. We returned to the waterfront restaurant La Plage, the same restaurant we ate the very night we arrived to Beirut. In French (which many Lebanese speak), the word anniversaire means both anniversary and birthday. Either occasion can nudge us to stop and take stock, and this week’s anniversary was no exception for me. Families stroll the Corniche (waterfront walkway) day and night, enjoying the fresh sea air. The weather and the food are always wonderful. Local politics continue to baffle me. Other things are different. Two years in, and I’m far from conversational in Arabic, which is not what I was anticipating when I arrived. (This list made me realize (1) I’m not alone – see #36; and (2) not understanding the Bedouin desert guide in Jordan wasn’t a reflection on my Arabic skills – see #17). But, this time when the waiter at La Plage asked, in Arabic, if we wanted our wine by the glass or the bottle, we understood. And could even answer. None of us are conversational yet, but we’re getting the important stuff down. I have some new favorite foods. Many of the dishes that we ordered on that first visit to La Plage have become our favorites of Lebanese cuisine: eggplant raheb, cheese rolls, fried fish. (The French fries were the kids’ pick, and hardly a new favorite.) I now refuse to go a week without a good fattoush (green salad with fresh thyme, mint, sumac and toasted pita chips). When we arrived to Lebanon, there were almost no beggars and few street vendors. Two years later, with more than a million refugees from Syria, there are some neighborhoods where women sell packs of tissue paper at every stoplight and boys hound to shine your shoes on every block. Tens of thousands of refugees in Beirut alone, just a small fraction of them visible on street corners to remind us of their difficult plight. Hundreds of thousands more hidden away in villages and informal settlements across the country, struggling to survive. Security has changed too. Concrete barriers have been placed around town to discourage parking and therefore the possibility of car bombs. No bombs in recent months, but many of the barriers are becoming permanent nevertheless, like these exceptionally tall ones that were recently painted with the Lebanese flag. Perhaps the rise of the concrete barriers is due in part to the discrediting of the bomb detector “wands” that security guards use at the entrances of mall and grocery store parking around the city. At my last visit to City Centre shopping mall in Beirut, I found that they had abandoned the wand in favor of an explosives detector similar to the kind I have seen at airports – the guard first swiped my car door with what looked like a small piece of paper, then put the paper into a handheld reader that can apparently register explosives. So City Centre, at least, is taking its precautions more seriously. On the other hand, the grocery store near my house has simply given up altogether, and gone back to allowing cars into its garage without any kind of check. Somehow both scenarios seem perfectly normal to me now. I had coffee with three Lebanese friends yesterday. When the waiter came to our table, two ordered in Arabic, one in a mix of Arabic and French (we were in the Francophile coffee shop Paul, after all), and I ordered in English. The waiter didn’t bat an eye, but easily switched between languages as he spoke with each of us. Trilingual waiters and conversations don’t surprise me anymore either. When we left Honduras two years ago, I found it hard to let go of what I knew before, and to see things here in Lebanon for what they are, rather than constantly comparing and evaluating things for what they are not. But I think I can finally say that I’ve adjusted here, and for better or for worse, the fattoush and fried fish, the refugees and the car bombs, the sunshine and the sea air all come together to make up my new normal. Beirut is like a family member now and I love her, warts and all. Maybe you are following this blog because you wanted to read about Beirut and all it has to offer. Or because you and I know each other personally, and you wanted to stay in virtual touch, thinking you’d hear about me and hubby and the kids and our adventures. Instead you keep getting these posts that circle back to Syrian refugees. I hope you’re not getting tired of it. The church I attend had a special program for kids during the month of October, to try and help them understand what all the grown-ups are always talking about, to help them (along with us parents!) better understand what refugees confront. Week 1: They talked about what the term refugee means (someone who has been forced to flee his or her country because of persecution, war, or violence), and then imagined what they would take if they were forced to leave home in a hurry, taking only what can fit in a backpack. It was hard, but I convinced my kids that a couple pairs each of clean underwear and socks would be just as important as the special toys they had chosen. Week 2: What does it mean to have no place to stay? The assignment for the week was to build a shelter out of cardboard and plastic bags and sticks. Given the dearth of trees within the Beirut city limits, the kids were allowed to use broom handles in lieu of sticks. Week 3: What can you do for food? While rations for refugees vary according to where they are and who is handing them out, the bare minimum for one day is apparently 400 grams of rice, 50 grams of lentils and 50 grams of cooking oil (which came in the form of some kind of yucky hydrogenated spread in a baggie). Water to drink. Each child was given one day’s ration, and challenged to eat only that food for one day. “But if we do it for just one meal, then there’s no challenge,” responded my son. The kids each got a Tupperware full of rice and lentils for lunch, and a smaller Tupperware of the same for their snack. When they came home from school, my son told me that he’d had the best food that day. “Really? ?” The rice was barely speckled with miniscule lentils, lacked all but a sprinkle of salt, and was utterly bland. Nothing like mujaddara, the delicious rice and lentils the Lebanese typically eat, abundant with plump lentils, scented with cumin and topped with caramelized onions. Had he defeated the purpose of the exercise? Receiving food you don’t like and finding a way to obtain an alternative – it was probably perfectly in tune with the challenges a refugee might face and how he or she might overcome them. I rolled my eyes, but appreciated his resourcefulness. My daughter was less happy about the experience. She had dutifully eaten rice and lentils, rice and lentils, rice and lentils. Then we sat down to dinner in front of another bowl of rice and lentils. “But this is the challenge,” I answered, trying to muster an enthusiasm about these lousy rice and lentils that I just wasn’t feeling. It was only two meals in a row, and I was sick of it too. But I held firm. Over dinner we talked about people beyond refugees as well. In Honduras, where we lived prior to Lebanon, more than two-thirds of the population lives in poverty, and roughly 46 percent of people live in extreme poverty (surviving on less than US$1.25 per day). Their staple diet is rice and red beans. Rice and beans, rice and beans, rice and beans. There’s probably a study by a UN agency somewhere that says what percentage of the world survives on a diet primarily of rice and legumes, and I’m sure it’s a lot. You couldn’t say that we had experienced what it is to be a refugee or to live in extreme poverty, as we’d had a regular breakfast (I’d even served extra fruit, to make up for the lack of it the rest of the day), we hadn’t had to actually sleep in a makeshift shelter, and we couldn’t shake the knowledge that if we had to fit everything into a backpack, we are fortunate enough to be able to buy replacements for the things we most need. But I hope the experience did help us to better appreciate all that we do have, to be more sensitive to the plight of those in need, and most importantly, to be more motivated and proactive in responding to those needs. It’ll be a while before I can serve the kids rice and lentils again though. Adapting the words of Ray Charles…. And it’s not just because I live in the Middle East. I can see from the US newspapers I read online, and I can tell from the phone calls that we get from my husband’s family in Italy, that Syria is the talk of the town (or at least of the news) in the US and across Europe as well. I go to the park… and talk with other parents about Syria. I go out with my husband for dinner with friends… and we all talk about Syria. I stop by a friend’s house… and we pointedly avoid the subject of Syria as we have coffee. But… she leaves her tv on as we sip ‘ahwe, and CNN talks about nothing but Syria. No need to tell anyone in Lebanon that. With 630,000 registered refugees and at least a few hundred thousand more unregistered Syrians living in Lebanon, we know that what happens there will not stay there. With cross-border kidnappings, some for revenge, others for ransom, on the rise, we know. With two car bombs in Tripoli and one in Beirut last month, we know. And, what we don’t know, we speculate about. Next door in Israel, citizens are stocking up on gas masks in case a US strike might mean that Syria strikes back by unleashing chemical weapons in Israel. Here in Lebanon we worry that a US strike in Syria could, for example, provoke a strike by Lebanese-based Hezbollah against Israel, which in turn would undoubtedly lead to an Israeli strike against Lebanon. (Hezbollah’s last major open conflict against Israel was in 2006, a 34-day war that according to Wikipedia, resulted in 1,191–1,300 Lebanese people, and 165 Israelis dead, and another one million Lebanese and 300,000–500,000 Israelis displaced.) Lebanon is trying to stay out of the Syrian equation through its “disassociation” policy for good reason. What is life without levity? Nour Malas wrote in the Wall Street Journal that there is now even a bridal shop in the Za’atari refugee camp in Jordan, as couples choose to live the moment rather than suffer the maddening incertitude, trading inertia for action. Likewise, I was determined this past weekend to get out of the concrete jungle, and remind myself of the beauty of Lebanon. With hubby, kids, and a whole another family in tow, I headed back to the Bekaa Valley to check out the restaurant Tawlet Ammiq. A day to enjoy a good meal, a glass of arak, and the company of good friends. Tawlet (which means table in Arabic) is a community-run organic restaurant on the western edge of the Bekaa Valley, in eastern Lebanon. The menu varies each weekend according to what the village women choose to cook, much of which they do at home and bring to the restaurant already prepared. Young men from the two nearby villages refill your water, lemonade, or arak glass. The food was fantastic – fresh and citrusy tabbouleh and fattoush salads; creamy eggplant, chickpea and yogurt spreads (mouttabal, hummus and labneh, respectively); kibbeh nayyeh (a raw beef dish similar to beef tartare); grilled chicken and fish. There was shish barek (meat pastries in a yogurt-dill soup), beef with frikke (toasted green wheat), and mulukhiyah (chicken stewed with some kind of leaves). For dessert, ripe nectarines, figs, cantaloupe and watermelon, lemon cookies and knafe, an Arabic dessert of sweet cheese topped with semolina crumbs and sugar syrup. The setting was as lovely as the food – the restaurant is built onto the slope of a hill that is dotted by trees and ruins, and home to two tiny churches. Most of the tables are outdoors, some on a grass yard, others in a breezeway, all designed to take advantage of the view over the valley. The restaurant is a transnational, interreligious effort, modeled after a development project in Jordan, its construction funded by Swiss development aid. While the cooks and waitstaff are from the Christian villages of Ammiq and Niha, the manager and his wife – who as head chef oversees the menu planning and food- are from a Druze village in the Shouf Cedar reserve. A tiny beacon of cooperation and successful co-existence in a region beleaguered by conflict. The mountains on the far side of the valley form the border with Syria, less than 20 kilometers from where we were having lunch. The green mountain straight up from the water pitcher in the first picture above, and the tiny village on the top of the mountains in the second picture, are part of Syria. According to the restaurant manager, shelling and bombing were a regular part of the auditory landscape until a couple of weeks ago, when one faction or the other (I think he said the rebels, but don’t quote me on it) gained control of a town in the area just on the other side of the mountains. I wondered if the sound of distant shelling affected the appetites of those dining at Tawlet on those earlier weekends. We heard what might have been a few shots off in the distance at a certain point – which in Lebanon could mean we were hearing anything from a celebration of a political speech or a birthday, to actual fighting from the other side of the mountains – and tensed as we waited to see if the noises continued, fully relaxing again only when they did not. And so we ate and laughed some more, carrying on, as humanity is wont to do, in the face of adversity. Naturally, things can change in an instant, and even as I was writing this post I heard the news of the latest developments: that a US military strike might be forestalled if Syria’s chemical weapons are turned over to Russia. The reprieve might be temporary, but we are good at the waiting game here. For now, it feels as if Lebanon has breathed a collective sigh of relief. *For those who aren’t already familiar with it, “What happens in Vegas stays in Vegas” is the smash slogan that Sin City (Las Vegas) created for itself a few years ago. Interestingly, in looking for an online link to the journal article, I stumbled across another article, this one also from July but published in the New Statesman, with nearly the same phrase – credited to former director of policy planning at the US state department Dennis Ross. I don’t know who said it first, but it’s a fantasticsound bite. The scent of gardenias wafted through my window as I sat working at my computer this morning. Their perfume reminds me of our arrival to Beirut, when there were vendors selling gardenia chains at every stoplight. And in turn, that reminds me that at the end of this month, we will have been here one year. There has been plenty of tension in Lebanon during that time, with a car bomb in October, and floods of refugees seeking shelter from the war in Syria. But those gardenias remind me of how many good things there have been as well. I hope that it has been clear from my blog posts how much more there is to Lebanon than the headline news. To that end, I wanted to share with you to a blog post by David Lebovitz, a California pastry chef who is now resident in Paris and was here in Lebanon a couple of weeks ago to explore the country’s food and culture. I hope you have a minute to take a look. Relishing the food, marveling at the hospitality, and with photos so fantastic you can almost taste the beautiful food. Or at least you wish you could. In fact, the ice cream shop he mention’s, Hanna’s, is just a few minutes’ walk from my home. Maybe I’ll head there now….